Rebecca Giguere, left, Valerie Fulcher and Robyn Schuchard inspected a 25-foot quilt consisting of 66 pillowcases with messages to the crew members of VP-9, who returned to Kaneohe Bay yesterday after a six-month deployment. 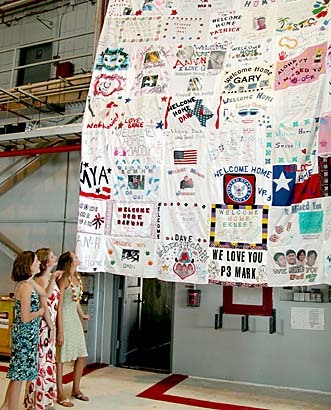 The 300 crew members of Patrol Squadron 9 were welcomed home yesterday by a 25-foot-high quilt made up of 66 pillowcases, each with a special message for a member of the "Golden Eagles." Deb Bridges, whose husband, Lt. Cmdr. Jody Bridges, is VP-9's maintenance officer, said the pillowcases were collected over a six-week period and stitched together by Jenny Urbano, the wife of the squadron's executive officer, Cmdr. Rod Urbano. Bridges' message to her husband was "East or West, home is the best." The squadron and its 10 P-3 Orion subhunters left its headquarters at Marine Corps Base Hawaii at Kaneohe Bay a day after Thanksgiving and was based at Misawa Air Base in northern Japan and Kadena Air Base in Okinawa. Cmdr. Urbano said VP-9's 425 officers and sailors played a crucial role by providing "eyes in the sky" surveillance for U.S. and allied ships that went through the Strait of Malacca on their way to the war on Iraq. "We weren't on the front pages," Urbano said, "but we directly supported the effort to combat terrorism in Operation Enduring Freedom in the Philippines." Lt. David Fulcher, who piloted one of the two Kaneohe P-3s that returned yesterday, said he felt "left out." "We should have been there," said Fulcher, who flew missions in the earlier war against Afghanistan. But Deb Bridges, who is expecting her fourth child in July, said this deployment, her husband's sixth, was easier to handle. "It's just because I knew he was in Japan." The Golden Eagles flew more than 600 hours in support of Operation Enduring Freedom -- Philippines. In April, the squadron participated in Exercise Tandem Thrust, held in Guam, working in a joint environment with Air Force and Marine Corps forces. Three months ago, a VP-9 aircrew helped locate three people adrift on a 19-foot open skiff. Located more than 200 miles from Guam, the skiff had been missing for nearly a week. After locating the small boat visually, surface units were directed to its location. In an earlier statement, VP-9's commanding officer, Cmdr. Dan Rieck, talked about the squadron's performance over the past six months. "I am truly inspired by the dedication and professionalism of each and every Golden Eagle." said Rieck. "Every member of the squadron -- maintainer, aircrew, and administrator -- has done an absolutely outstanding job." Navy Dentalman Cris Mar, whose wife, Petty Officer Virginia Mar, is one of the 128 women in the squadron, said his wife found her first six-month deployment to be hard. "Just everything is hard," said Mar, who works at the Makalapa Naval Clinic. Mar, who has been married for 1 1/2 years, said his wife is looking forward to fixing the couple's home and garden in the naval housing complex near Pearl Harbor. Lt. Eric Schuchard, a P-3 tactical coordinator, said the missions were long. "Working out of foreign countries is always tough,' said Schuchard, who completed his second deployment. His wife, Robyn, said her contribution to the quilt was a pillow with a yellow surfboard and the message "Surf's Up." "He really misses surfing badly," she said as she waited for husband's plane to land at Kaneohe Bay. Valerie Fulcher said the pillowcases were donated by spouses, relatives and parents. "We collected from aunts and uncles and moms and dads from all over the United States," said Fulcher. "It was a lot of fun." Deb Bridges said the next job will be to take it apart "so we can return them to the families."